ZaVita SSF, aka Princess, is the farm favorite. She is the only daughter we’ve retained from our foundation mare, La Vita; so, she’s a favorite emotionally as well. Princess’s sire, Contango, is one of my favorite dressage sires of all time. 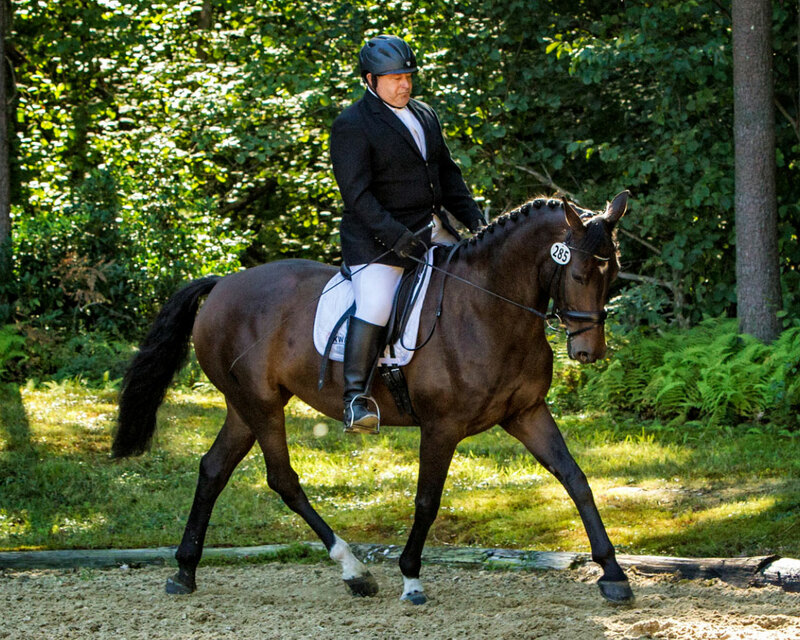 He won both the dressage and jumping portions of his 100 Day Testing, and went on to become a very successful Grand Prix dressage competitor. 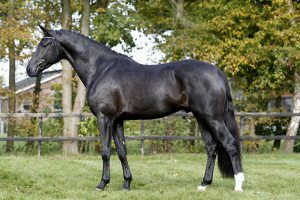 When Contango’s first foals hit the ground in Holland, breeders were more than a little skeptical—these foals were not necessarily pretty or modern in type. Consequently, and fortunately, our friends at Iron Spring Farm were able to acquire him for American breeders. Once Contango’s first offspring came under saddle, the Dutch breeders were very sorry that he had left Holland. All of his offspring “wear the bridle”; they’re incredibly ridable. Contango has shot up the KWPN’s dressage index. Knowing my admiration for Contango, Carol bought me a breeding as a Father’s Day present, with the understanding I would keep the resulting foal as a riding horse for me. This mare was, literally, born on my feet during a break from school the next year. I feel incredibly fortunate to have a Contango daughter in our breeding program. This mare was first premium and top foal in New England in 2004. In 2007, she became a ster mare and was the top ster mare at the New England keuring. In March of 2009, she produced a super filly by UB-40, EzaVita SSF. Instead of rebreeding Princess, we put her back into training to fulfill Carol’s intention, for her to become my riding horse. As luck and life would have it, the summer we put her back into work, I was diagnosed with Colon Cancer, and spent the next year undergoing surgeries and chemo therapy. Somewhere around May of that following year, my good friend Jane Hannigan showed up and insisted on restarting Princess so she would be ready for me when I could ride again. So, in August of 2011, just a little bit before I was cleared to be doing much since my last surgery, I started riding my mare again at Jane’s. At first it was only 15 minutes at a time, but, over the next two years, we really progressed and started schooling some upper level collection. Because of the hour and a half drive (one way) was starting to take a toll on my life, I decided to bring Princess home. Over the next year, we got back to some solid basics and were really starting to put it all together when she injured her check ligament and needed months off. In my depression over not being able to ride, I bred her. I’m not sure what our plan is at this point. Her genetics are super for our program, and I have a coming four-year-old to be riding this year, so my beloved Princess—who was a major healing force in my recovery from Cancer—may well stay in the broodmare band. Regardless, she’s earned a place here for life. Her 2015 Governor foal, Keno SSF, went on to become the Champion foal in North America. We immediately bred Princess back to Governor, and have a coming yearling—Magic Mike SSF. Princess is currently in foal to Don Olymbrio, and I’m seriously hoping for a filly. She will be bred to Gaudi in 2018.